“I never expected all this buzz and box office success"
On May 18th, THE WAILING premiered to great acclaim in the Out of Competition section at the Cannes Film Festival. From director NA Hong-jin, it was his third invitation to the prestigious festival, following The Chaser (2008) and The Yellow Sea (2010). Already a huge hit in Korea, where it opened on May 11th and has already crossed the four million admissions mark, THE WAILING is on track to become his biggest success to date. A day after its gala premiere in Cannes, where it received a six-minute standing ovation, director NA Hong-jin and his lead actor KWAK Do-won sat down briefly with KoBiz on the rooftop of the Marriott Hotel on the Croisette to discuss the film, its success and the impact it has had on them. KoBiz: After generating an enormous amount of buzz, the film has been a huge success in Korea. Did you ever expect such a response? NA Hong-jin: Out of the three films that I’ve done so far, this is the script that I added the most commercial elements to as there is a great diversity of spectators in Korea. With genre films there are people who love them and people who hate them so I felt that I should be careful to make it commercial. However I never expected all this buzz and this box office success. 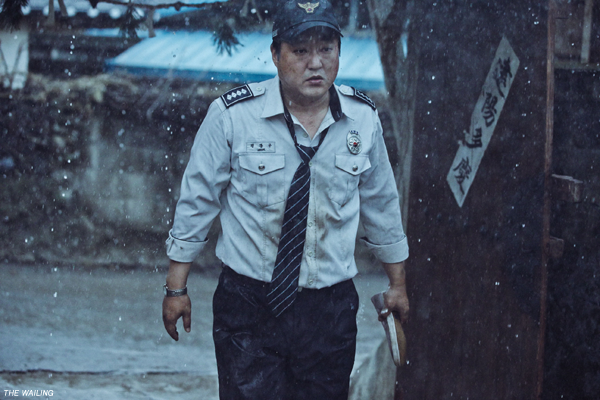 KoBiz: The inefficient policeman is a staple of Korean cinema. But unlike, say, SONG Kang-ho in Memories Of Murder (2003), we’ve never seen an officer quite so anguished as Jong-goo. How did you prepare to portray that desperation so effectively? KWAK Do-won: As you say, Jong-goo is not an effective policeman, he becomes scared easily. However, as the movie progresses he becomes very strong because of his love towards his child. When I read the scenario it was very well shown how the character builds up to become strong that way. One point that I hope the audience will catch is that the shaman (HWANG Jung-min), the mysterious girl Moo-myeong (CHUN Woo-hee) and the Japanese stranger (Jun Kunimura) keep changing, while Jong-goo doesn’t change. The reason is his love for his daughter, which I see as the key point of my character. He’s the only character who doesn’t change and I truly hope that audiences can feel this. KoBiz: Much like The Yellow Sea, THE WAILING starts slow and gradually builds to a fever pitch. Was this part of why the film was in post-production for so long? NHJ: Rather than my previous films, the cutting style of THE WAILING was very different so it took me a long time. It was the longest time I’ve spent on writing and the longest shoot I’ve done after which it took a long time to figure out where to cut and how to edit it. I also wanted to add a psychological touch to impact the audience which also led to this long editing process, as I needed to calculate the audience’s response. In Korea, even though this length of post-production is considered unusual, subjectively, it turned out to be just the right amount of time for me on this project. KoBiz: Given what happens to your character’s daughter, was it upsetting filming some of the more intense scenes with KIM Hwan-hee? KDW: I’m not married and I don’t have any children so at first when I read the script I was able to understand everything but what was hard was figuring out to what extent I should express my love for my child. When we were shooting, my memory often returned to my own parents. I thought about how my mother treated me and how my father treated me. I realized it wasn’t about the amount of love I should express but rather the amount of love that I received from my own parents, which is what I tried to portray in my scenes. Of course KIM Hwan-hee was so amazing that it became easy to express this sort of affection for her. May I ask, are you parents still alive? KDW: Weren’t you a bad child when you grew up? KDW: My parents passed away already but when they were alive I was a very bad boy. (laughs) You should call your parents a lot! KoBiz: You’re right, I should. KDW: While I was filming, I thought about the parents I lost and felt a lot of regret from time to time. KoBiz: I don’t think I’ve ever seen such an intense child actor’s performance in a film. How did you draw that out of KIM Hwan-hee and do you think you’ve traumatized her for the rest of her life? NHJ: Regarding the trauma I don’t think she’ll be affected that much. When I cast her I spoke with her thoroughly about her religion and how her family is involved with it. I certainly hope she wasn’t traumatized! Concerning her appearance, I approached her not as a child actor but just as an actor. For six months I had to guide her as a performer, both physically and psychologically. I felt it was enough training for her to jump into the scene. I treated her the same as the adult actors and had a lot of respect for her as her performance was so amazing. She never read the script, it was her mother who read it and who explained it to her. When she came to the shooting location I checked with her to see how much she understood of the scene and within that boundary I did my best to direct her on location. I really think she is an amazing actress, who is innately talented. I was very grateful to have her on set.